The Dark Ages ran for about 400 years, from around the fall of the Roman Empire, in the middle of the 6th century, to around the 10th or 11th centuries. It was dark because the light of Rome had been extinguished, while that of the Renaissance had not yet burst into flame. And it was supposed to be a time when the culture and economy of Europe slumped. Peasants in scattered rural settlements scratched out a living in ignorance and obscurity. Recent archaeological excavations, however, have changed the way people look at the Dark Ages. 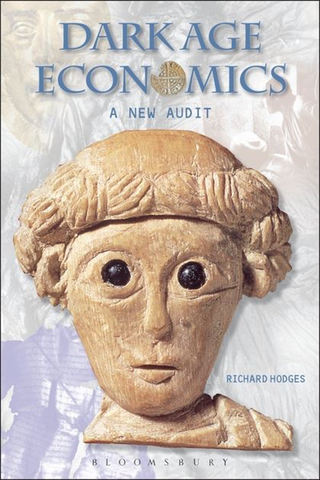 Richard Hodges, President of the American University in Rome, wrote a book back in the 1980s called Dark Age Economics, and it subscribed, more or less, to the prevailing wisdom. Recently, though, he has completely written the story, and Dark Ace Economics: A New Audit reinterprets this fascinating period in Europe’s development. He presented a very brief introduction at the recent sustainability conference organised by the American University of Rome and the American Academy in Rome, where he said that farming in the Dark Ages was much more productive and sustainable than people previously thought. Luckily, the American University in Rome is close at hand. There is a lot more I would have liked to go into; the spread of the plough, animal breeding, the wool economy. I confess I find this sort of thing very beguiling, and I hope you do too. Maybe another time. Dark Ace Economics: A New Audit is published by Bloomsbury. The extreme weather events of 535–536 were news to me; they shouldn’t have been.